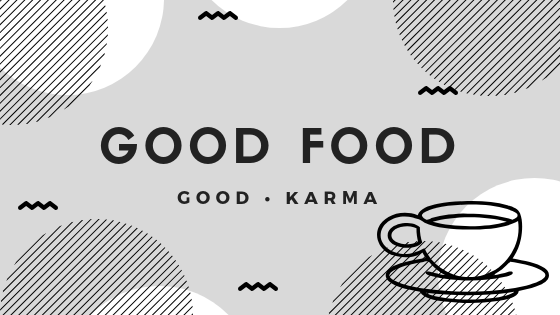 Two Birds Cafe – #Zomatomeetup | Good Food, Good Karma. I’m not a summer person, and currently I’m staying inside on a 37 degrees Celsius day, with the air con on, surrounded by iced drinks. However, I love summer food. I love the refreshing, sweet, lightness of it all. 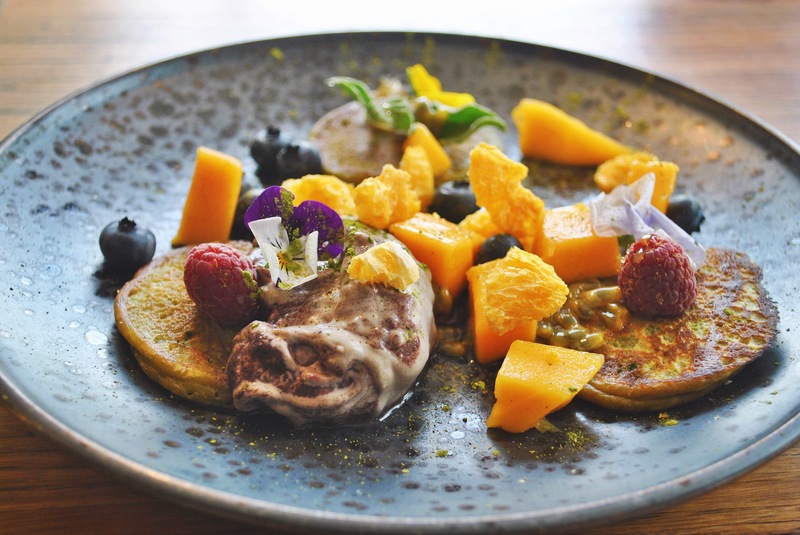 Mango sorbet, cucumber salad, smoothie bowls…. all of it is delicious. 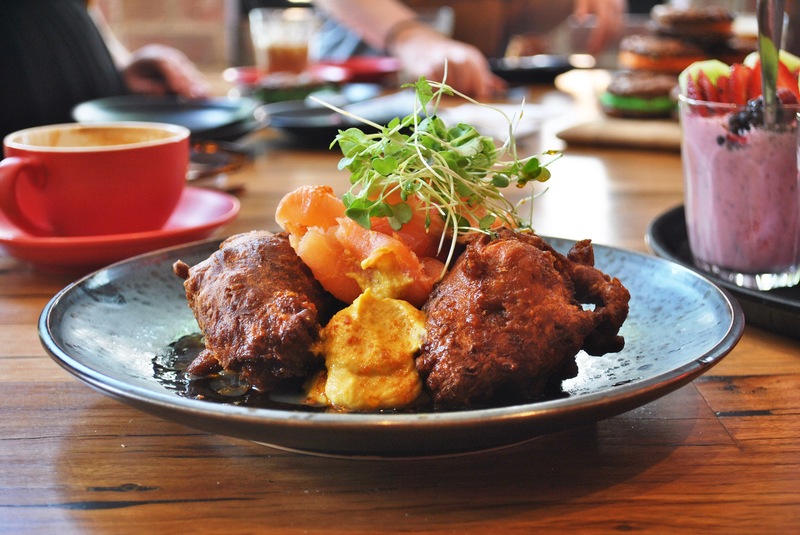 A fantastic example of a beautiful summer menu, is one I experienced at Two Birds Cafe during a #Zomatomeetup. 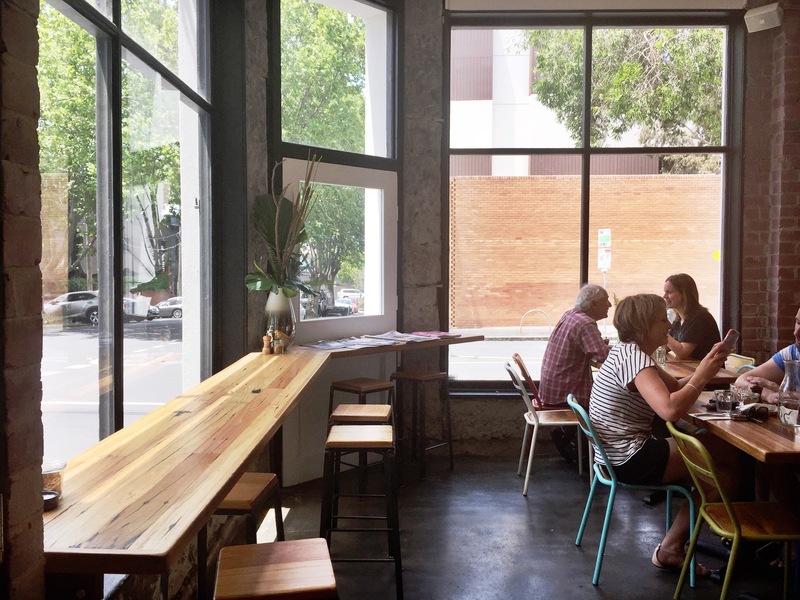 Two Birds Cafe, in Collingwood is a gorgeous space, with light wood and exposed brick and the sun shining through walls of windows. 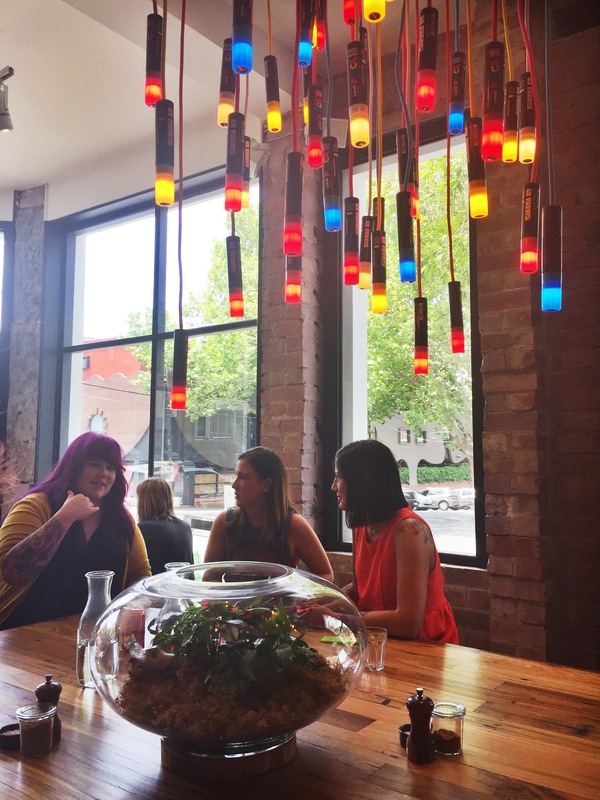 It has a simple interior, mainly neutral, with spots of colour throughout, all brought together with a colourful chandelier hanging over a large communal table. Doesn’t this dish look summery? 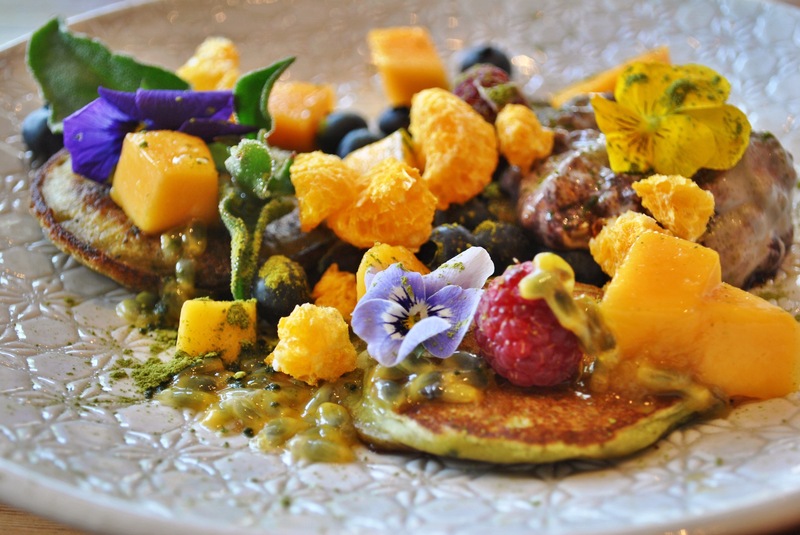 It is matcha (Matcha Maiden) buttermilk pancakes with acai mascarpone, mango, passsionfruit, raspberries, dehydrated fruit and edible flowers. Here is a close up for you (on a white plate, it was my neighbours, as I couldn’t decide which plate I liked best. : p ) Stunning, right? It was spectacular to eat too, the only thing I would have wanted more of is the matcha flavour – I’m a big fan of that sweet/bitter green tea kick. 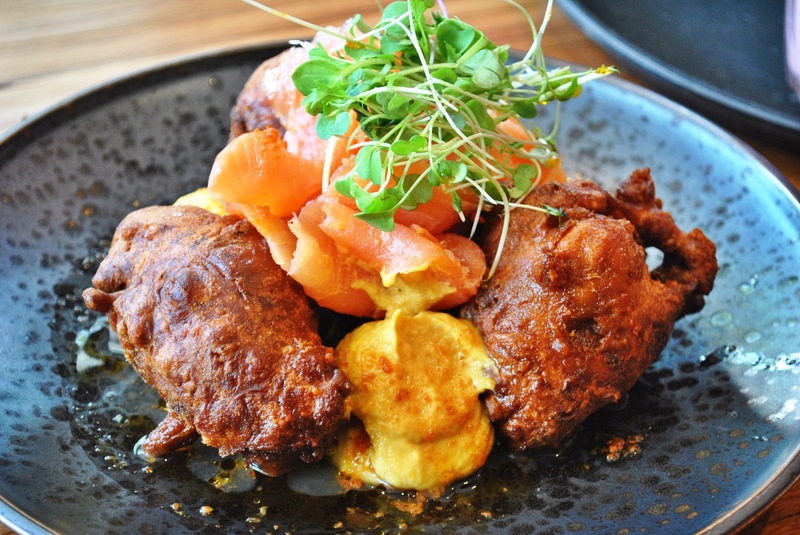 These cauliflower fritters with roast pumpkin puree, baby spinach and smoked salmon felt so good for me and healthy, but didn’t taste “healthy.” The cauliflower was spiced beautifully, and the pumpkin was moreish. I think I would have wanted the fitters to be a bit moist, however, it was a lovely light dish, with substance. It also had pretty colours – mmm, look at that pumpkin! These cute ‘Summer Berry’ smoothies usually come in bowls, but since we had so much delicious food to eat (and my stomach isn’t Mary Poppins’ bag) so I was glad to have it in a glass! 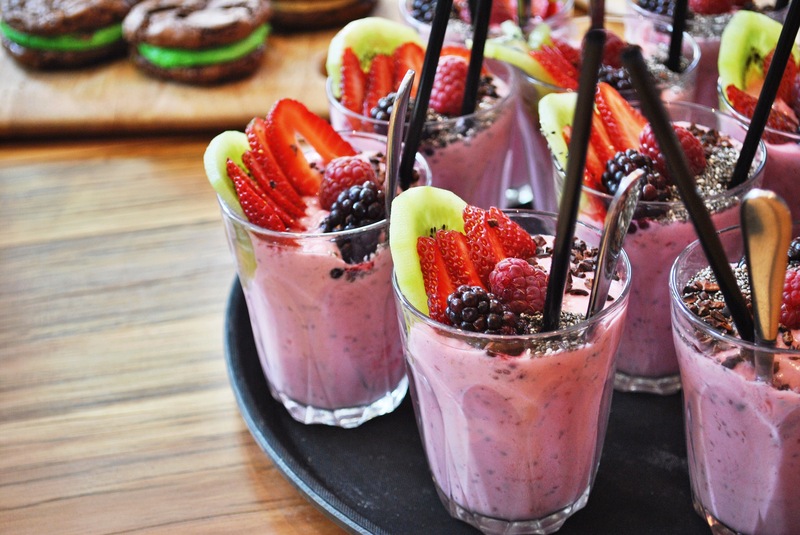 There were chia seeds, cacao nibs, berries, kiwi and it was so refreshing! Two Birds Cafe has also recently started selling Bistro Morgan’s sweets. Morgan is a young man in high school, who makes all these delicious sweets and delivers them (with the help of his mother) to several trendy cafes through out Melbourne. It is amazing that someone so young has such skill, creativity and ambition. 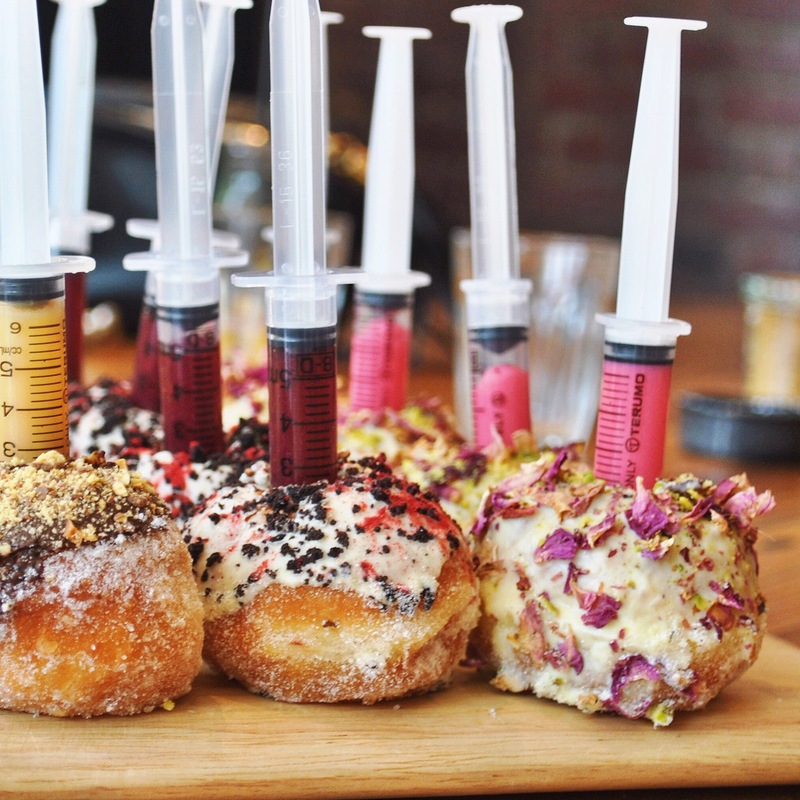 Have a look at these amazing doughnuts – with the filling in syringes, and topped with rose petals and pistachio or white chocolate and raspberry – such creative flavours! 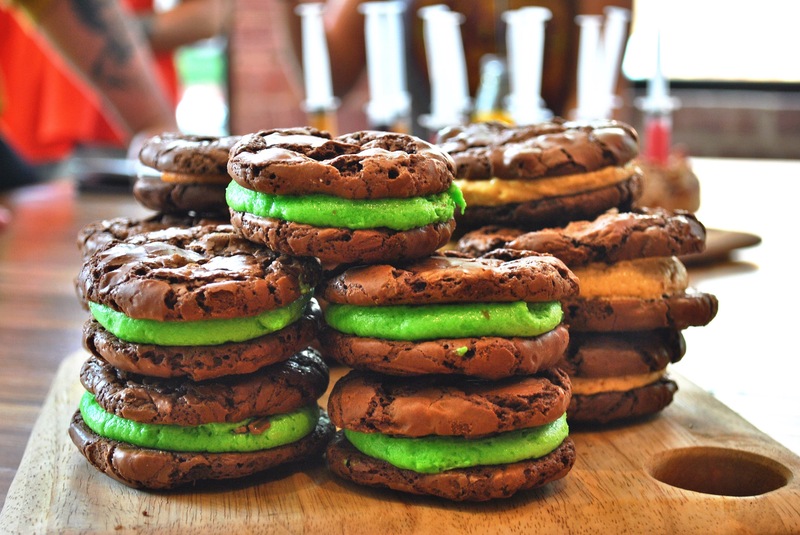 Or, my favourite- chocolate brownie cookies filled with fillings such as peppermint crisp (SO GOOD), salted caramel and jaffa orange! 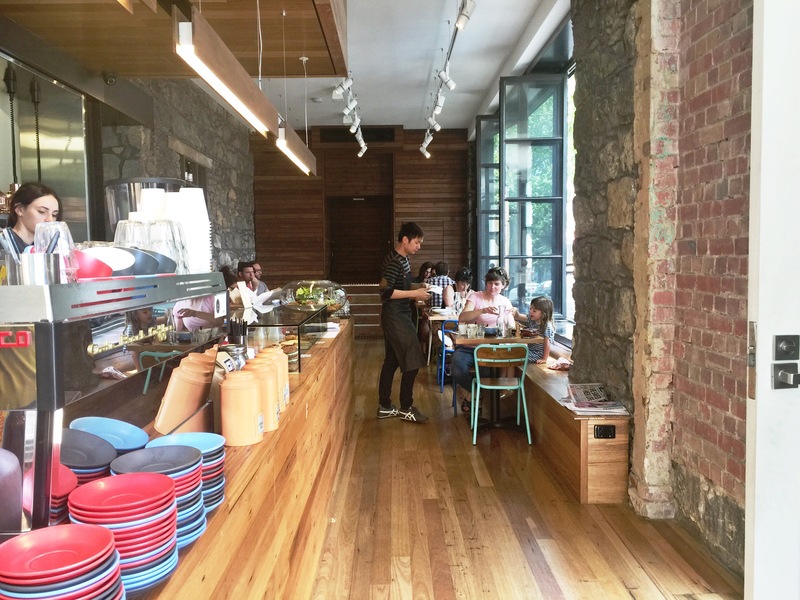 Seriously check his creations out, a list of the cafes which stock his wonderful cakes are here. I want to say a big thank you to Zomato, for inviting me to this epic meetup, and another thank you to Two Birds Cafe, for inviting us and making such awesome food. Plus, a massive applause and thank you to Bistro Morgan, for providing such delicious sweets. 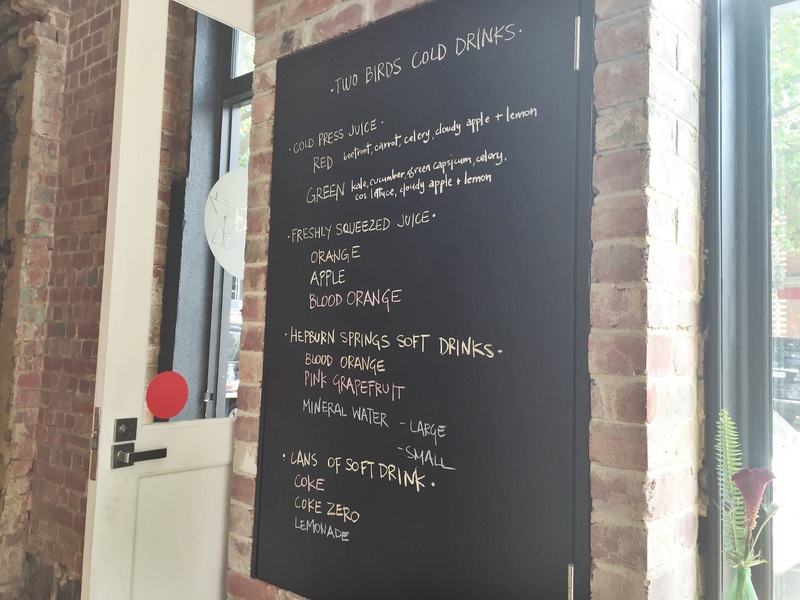 Disclaimer: I was invited by Zomato and Two Birds Cafe to taste their menu. My meal was paid for by Zomato and Two Birds Cafe. Oooohhh jealous of your meal neighbour – those pancakes look amazing! !